A married couple went to the hospital to have their baby delivered. 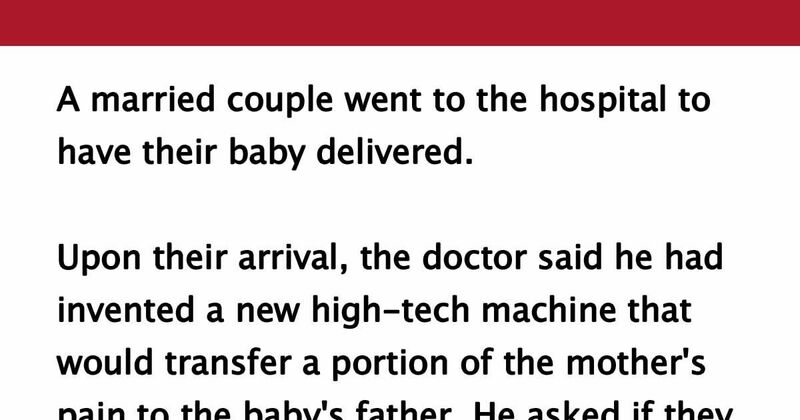 Upon their arrival, the doctor said he had invented a new high-tech machine that would transfer a portion of the mother's pain to the baby's father. He asked if they were willing to try it out. They were both very much in favor of it. The doctor set the pain transfer to 10%, for starters, explaining that even 10% was probably more pain than the father had ever experienced before. However, as the labor progressed, the husband felt fine and asked the doctor to go ahead and "kick it up a notch." The doctor then adjusted the machine to 20% pain transfer. The husband was still feeling fine. The doctor checked the husband's blood pressure and was amazed at how well he was doing at this point, so they decided to try for 50%. The husband continued to feel quite well. Since the pain transfer was obviously helping out the wife considerably, the husband encouraged the doctor to transfer ALL the pain to him. The wife delivered a healthy baby boy with virtually no pain. She and her husband were ecstatic. When they got home, however, they found the mailman on their front porch. Dead. Oh no! LIKE and SHARE this joke with your friends!